The latest volume in our bestselling slow-cooker cookbook series features an all-new collection of fresh, full-flavored recipes made with leaner cuts of meat, heaps of fresh vegetables, and hearty whole grains. For everything from meat and potatoes to pastas, casseroles, soups, stews, and even desserts, we’ll teach you the very best kitchen-tested techniques to build bold flavor without added fat and calories. YES! 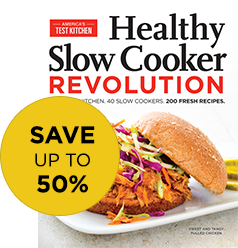 Please send me Healthy Slow Cooker Revolution for just $19.95, a 25% discount off the cover price of $26.95, plus shipping and handling. America's Test Kitchen will not sell, rent, or disclose your email address to third parties unless otherwise notified. You will also receive Notes from the Test Kitchen, our free weekly newsletter, along with special offers from America's Test Kitchen. You will be redirected to the PayPal website when you place an order.